Hello leafpool_love , see you have stumbled onto Purple Hearts Banner page, which is run by Brooke . I can only make banners at this time. 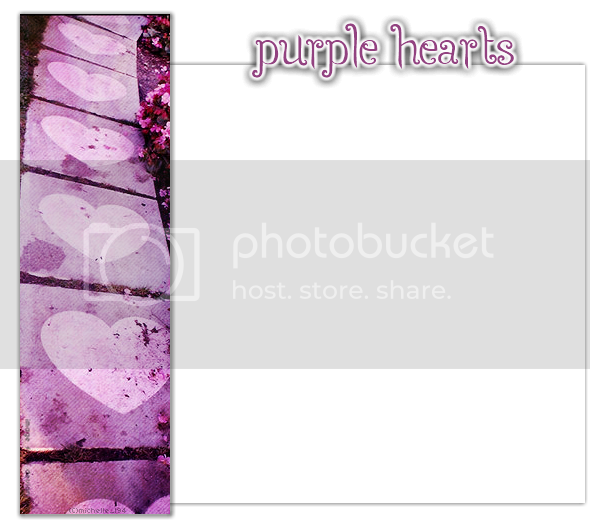 Purple Hearts opened on Valentines day of 2011 and going great! Feel free to look around my site! Hope you like it :) I love fan mail! ^_^ but I will delete spam and hate mail. Added a new lister and three new banners to my portfolio! Finished two requests this morning! added four new affies this morning. Added four new affies and a lister! Now listed at Also re-added a affie! The storms are gone, for now :( . I finished a request sorry I've been closed because we didn't have power. Re-added one of my affies! Added a affie! Also got three requests done! I added a couple of question and my answers to my FAQ! Also added a new affie! Added a new affie today! Purple Hearts is now OPENED AGAIN!!! :D I am still missing listers and affies. PLEASE neomail me if you know where I'm listed or are affies with me! • I have three sisters one older and two younger. • I have a calico cat named Fudge and a new addition Bella our grey kitten. • My cat Fudge and Bozley are MY two babies! If you have questions please look here first before you neomail me. Can I edit a banner you made for me? Absolutely NOT! If there's something you don't like about a banner I made tell me and I can fix it. Can I request more then one banner at a time? I would rather you not request more then one at a time. will I be able request another banner? absolutely! ^_^ just please request one banner at a time. I sent you a request why wasn't I added to the waiting list?? either I lost you're request, you didn't fill out the form with detail, or you didn't have MY magig word right. Question - Why do you have so many Taylor Swift banners?? Answer - I take banner requests on her site so I have a lot. I use photoshop for all my banners. Whats the difference between a normal banner and a name banner? A normal banner has pictures and text and a name banner is just text and a colorful background. Pretty simple, you don't follow my rules I don't make a banner for you. No claiming my banners as your own! Please don't flood me with neomails asking when I will be done. Give me a day or two, I have a life you know. If you don't follow rule 3 I will NOT make your banner. 5.My magic word is love. If you don't have it where it says MY magic word, I won't make your banner. I spend time on ALL banner requests! If their is something you'd like me to change please let me know, it won't be a problem. I do check to see if you are still using my banners. If you are no longer using it I do delete it. I have five different sections to my porfolio, the Neo-related, Miscellaneous, Name banners, Animated and Taylor Swift. To see the full sized banner please drag to url. Ok so I did my first background ever! Will I do more? I guess so :) I added a background form! To get one of my backgrounds from here please neomail me. I have school work to do so they are slow. 1. Your name & user: 2. Image(s) on banner: 3. Text on banner: 4. what font would you like: 5. Font color: 6. Banner size(most of my examples are 500*200): 7. My magig word: 8. Where will this banner be used? : 9. Anything else? 1.Your name & user: 2. Slide show? yes or no: 3. If yes what picture(s) would you like on the first? Second? ect. 4. Background color? 5. What do you want each slide(s) to say? 5. Font(s) and color? 6. My magic word: 7. Banner size? (in pixels) 8. Where will this banner be used? 9. Anything else? 1. Your name & user: 2. Images or Color? 3. Any text? Font? 4. Where will this be used? 5. My magic word: 6. Anything else? I only take 6 requests at a time before I close! After I am done with your banner I will neomail you! Too see full size of all fanmail and rewards drag to the url. Layout & Coding by Merely Michelle.